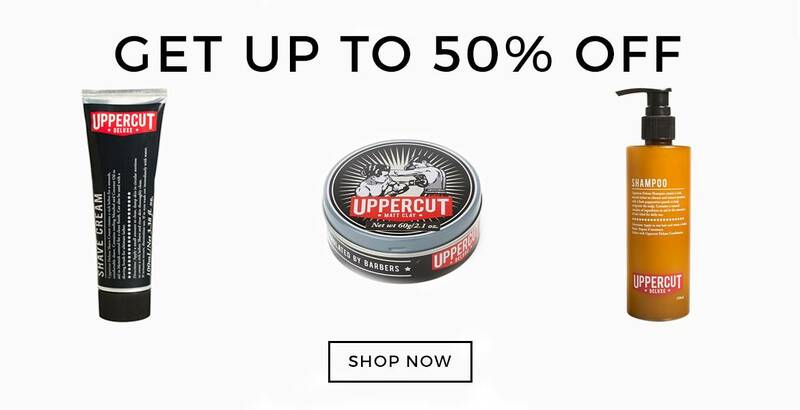 Uppercut Deluxe is a brand that specialises in the very best hair and grooming products for men. With many resistant to the idea of specialised pomade and specially crafted shampoo for men, Uppercut had to push hard against the stigma attached to male grooming, but they managed, and we've made sure to keep the store well stocked with their products. We've got pretty much everything you could need to stay looking spick and span, including Uppercut Deluxe pomade, Uppercut barber's favourite shampoo, and a handy combo kit that could easily be given as a gift...for yourself. Uppercut hair products are made with the best ingredients, focusing on the overall care of your hair and scalp. With our Uppercut voucher codes, you can grab everything you need to keep perfectly groomed, at up to 50% off. Keep up to date with all of our future sales by signing up to our newsletter. Not only will you receive updates on our sales, but you'll also get the latest editorial stories, the occasional coupon code, and 10% off of your first order from The Idle Man. On top of that, if you spend more than £5o on our website, we'll give you free shipping on your order. Your friends can also benefit from our discounts, and with our Refer a Friend scheme all you need to do is share your discount code on social media, or invite your friends via email, and we'll send them £5 worth of credit. You’ll then get £5 as well if your friend spends £30 or more in their first shop. If you're a student then check out our Student Discount page and get 10% off Uppercut and plenty more brands with a valid NUS or student card. Be sure to take advantage of our special double discount days to get up to 20% off as well. Uppercut Deluxe was the creation of Luke Newman and Steve Purcell, both established barbers who were frustrated at the attitude towards male grooming. They wanted to prove with their brand that men could look after their appearance without using 'feminine' products or spending all day on their hair. With Uppercut, hairstyles don't need to stay looking a certain way, and you can easily change up your appearance with the right product. With our Uppercut voucher codes, you can grab any of these products at a nice little discount, ensuring you stay looking your best for less.